After teasing us last week, Land Rover has finally unveiled it's brand new model, the Range Rover Velar, at a glitzy event at the London Design Museum. The Velar is a premium SUV which sits between the Range Rover Evoque and Sport in its model lineup. It's a highly desirable vehicle with an emphasis on design, luxury, and technology. 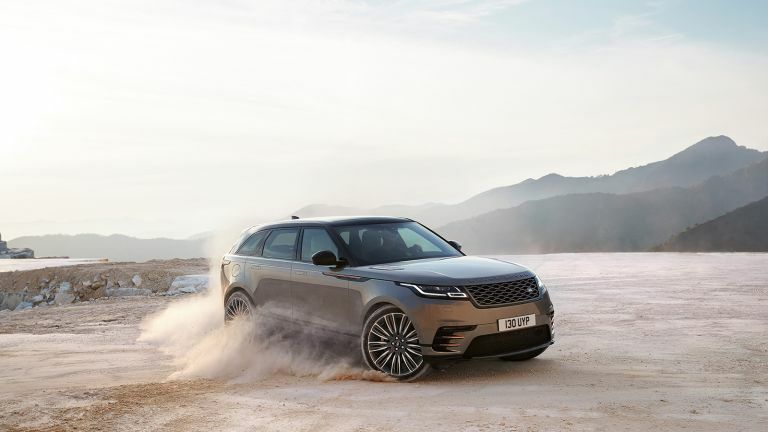 If you're not already checking how much is in your savings account, here are ten reasons you'll lust after the Range Rover Velar. You've got eyes, look at it! The Velar has a very dramatic appearance, it's powerful, with a beautiful balance between futuristic and classic lines. The large 22-inch allow wheels give it an intimidating yet elegant stance. Yes, we're very taken with it, if you hadn't noticed. This biggest departure from current Range Rovers is on the inside - the traditional button-filled centre console has been replaced by Touch Pro Duo, a brand new touch-only infotainment system. Touch Pro Duo consists of two 10-inch HD touchscreens with capacitive buttons (which are sectret-until-lit) hidden underneath. This makes the interior look super modern and spacious. You'll also have the option to spec a 12.3-inch Interactive Driver Display in the instrument binnacle, which replaces the analogue speedometers. It looks like a real tech-lover's interior, but the technology is seamlessly integrated within the cabin rather than being tacked on as an afterthought. Just like Tesla and other futuristic cars, the Velar's door handles will lay flush with the body until they're needed. I often have this dilemma - I find myself with a spare £50k - £60k, do I buy a top-spec Evoque, or base-model Sport? Thankfully I no longer have to make that decision, the Velar fills that gap, starting at £44,830. It's also larger, and more practical than the Evoque, but smaller and easier to park than the Sport. It's the best of both worlds. The top-spec Velar will feature JLR's 380PS supercharged V6 petrol engine. This will propel the SUV from 0-60mph in 5.3 seconds (with a glorious sound track as well, we're guessing). There are also more frugal engines available, such as four-cylinder Ingenium diesels, and the V6 diesel which combines a massive 700Nm of torque with CO2 emissions of only 167g/km. Past Range Rover interiors have featured a sumptuous blend of leather, metal, and wood. The Velar is a slight departure from that, instead it'll be the first to offer a new sustainable Suedecloth material. Suedecloth fibres are created from recycled plastic bottles, and crafted into a textured non-woven material (that resembles Suede, we're guessing). This new material was developed with Kvadrat, a luxury textile company. It's part of the Interior Premium Textile Pack, which consists of a Dapple Grey wool-blend textile with a Suedecloth insert available in Light Oyster or Ebony. Elsewhere in the cabin you'll find a more sophisticated and refined design language, which aims to create a 'calm sanctuary'. While you'll still need to pay attention behind the wheel, the Velar comes with all the driver assistance tech you'd expect from a modern car. There's Autonomous Emergency Braking, Adaptive Cruise Control, Queue Assist, and an Adaptive Speed Limiter. It wouldn't be a Land Rover if it couldn't drive off-road. The Velar will be all-wheel drive, feature Intelligent Driveline Dynamics and an optional active locking rear differential. You'll also get traction control tech such as Hill Decent Control, Gradient Release Control, and Low Traction Launch as standard, and the option to add Terrain Response 2 and All Terrain Progress Control. All of these will ensure you have grip whatever you're driving on, and remain in control of the vehicle. The Velar will offer a choice of four audio systems. The most impressive of which is the 1,600W Signature Sound System developed with British audio experts Meridian. The name, Velar, was first used by Land Rover when developing the original Range Rover prototypes back in 1969. It's derived from Latin velaris, and means to veil, or cover. It's a nice little nod to the past, and suggests this new model is the biggest step forward since the original was announced 50 years ago. The Range Rover Velar will go on sale in Summer 2017 priced from £44,830. Get those orders in early though - Land Rover will be offering a pimped out 'First Edition' model. This will be only be available for one model year, making it very desirable and exclusive. The First Edition is the even more luxurious than HSE spec, featuring the 3.0-litre V6 petrol and diesel engines, as well as a wealth of extra features as standard, including perforated Windsor leather seats in Nimbus or Ebony, 1,600W Meridian Signature Sound System, Matrix-Laser LED headlights and 22-inch Split-Spoke wheels with diamond-turned finish. The First Edition will also have the option of limited edition colourways. These are Corris Grey, Silicon Silver, and Flux Silver – which feature a unique satin finish which is hand-sprayed by JLR's Special Vehicle Operations’ team.